About 70 million light-years distant, gorgeous spiral galaxy NGC 289 is larger than our own Milky Way. Seen nearly face-on, its bright core and colorful central disk give way to remarkably faint, bluish spiral arms. 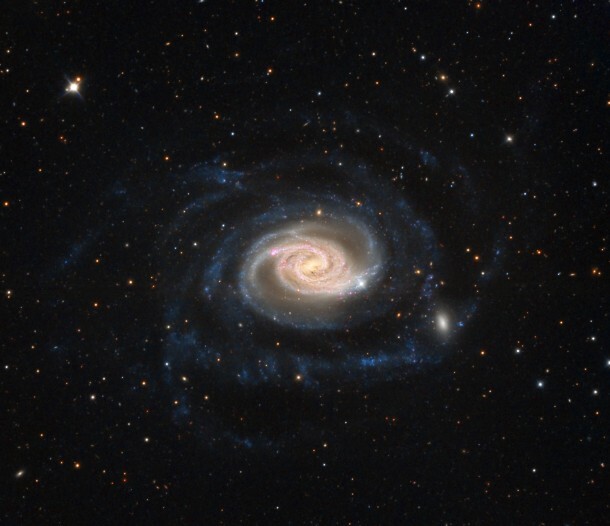 The extensive arms sweep well over 100 thousand light-years from the galaxy’s center. At the lower right in this sharp, telescopic galaxy portrait the main spiral arm seems to encounter a small, fuzzy elliptical companion galaxy interacting with enormous NGC 289. Of course the spiky stars are in the foreground of the scene. They lie within the Milky Way toward the southern constellation Sculptor.